These are obviously older books. 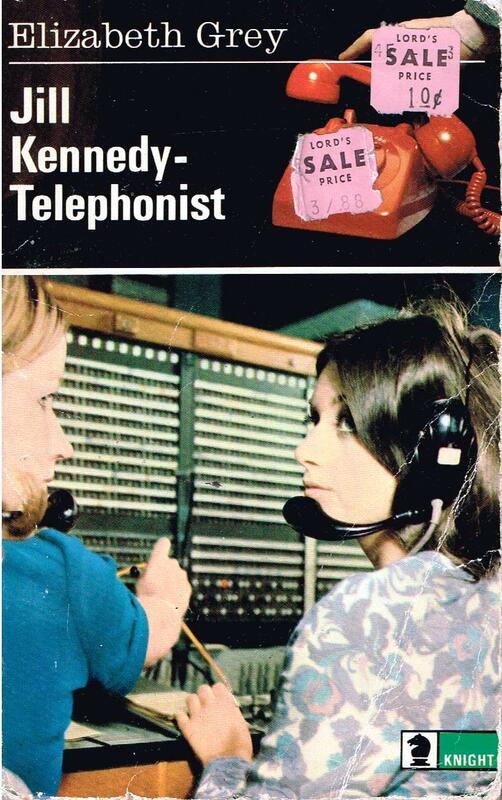 Jill Kennedy – Telephonist, by Elizabeth Grey, was first published in 1961. They are also, of course, British, telephonist being an older British term for operator. The story is straightforward, if dated. Jill is almost sixteen, but dropped out of school due a bout of polio. Now recovered, she’s not sure what to do with herself, and has little interest in working in her dad’s ironmongery (hardware) store. A couple of chance encounters lead her to apply for a job as a telephonist. Her parents are not thrilled at the prospect, but her mother helps her buy a new dress and purse for an interview. She’s hired, after a gruelling interview that includes questions like “How many pennies are in a pound?” and “Who is the President of the United States?” The practice of asking irrelevant interview questions is nothing new. She’s hired. She knows there are 240 pennies in a pound. (Until the introduction of decimal currency in 1971, there were 20 shillings in a pound, and 12 pennies in a shilling). The bulk of the story is a six week training class, described with sufficient detail that I believe I could do the job myself. The training takes place in another town, and the applicants board with local residents during the week, so there are horizon broadening experiences. Jill successfully completes the course, but learns a few lessons along the way, generally related to time management and business etiquette. Leave enough time to make your bed, don’t go out to see a movie when you should be studying, have good clothes for the office but don’t overspend, and so on. At the end, she’s happily working at the phone exchange in her own town, has covered shifts in a smaller town, and has explored the possibility of a promotion to an exchange in London. As for the new boyfriend, she does meet a boy, and visits him on her weekends home, but there’s no strong romance. She tells a friend that it’s far too early to be thinking about marriage. Whenever Jill and her boyfriend talk about the future, it’s in terms of their respective career ambitions. He works in his dad’s garage, but belongs to a camera club and is planning a film. Their movie dates are a little awkward, as she follows the story and he only wants to talk about camera angles. Jill’s female friends are all similarly inclined to career before marriage, though marriage is still an eventual goal. The most entertaining aspect of the book is the detail of life in 1960s England. A postscript in the 1970 reprint adds pages of details about changes in the telephone system and the training program, including use of the word operator. The most puzzling aspect of the book is why it exists. Was there a government suggestion to produce books like this? Or did the publisher decided enough girls were interested in entering the workforce that they would want to read about the process? The other careers listed in the series, like operator, were traditional female jobs in the 1960s, except Doctor. I’m quite curious as to why Margaret became a doctor and not a nurse. I’m also wondering exactly what line of work Rennie got into. Whatever the reason for its existence, and despite its pedestrian plot, Jill Kennedy – Telephonist is well written. Grey manages to bring some depth to minor characters, and keeps the story moving briskly despite the weight of describing training to be an operator. No bubble bath rating, since it’s not a romance, and the main function of the romantic subplot is to show that careers come first, but still a pleasant read. It came from the laundry room, but I might keep it around just for the period it illustrates.